Here is an attractive programme of music for cello and piano by composers who wrote little for this combination of instruments and for neither of whom chamber music is especially representative. In fact, this very full disc undoubtedly contains most, if not all, of the music for cello and piano by either composer. Rachmaninov composed his Cello Sonata shortly after his Second Piano Concerto, which followed a long period of depression on his part. I find this sonata as inspired as his piano concertos and there are certain resemblances in the lyricism of the sonata to the themes of the Piano Concerto No. 2. Indeed, the piano plays a role here equal to that of the cello — not surprising in the least. This is a big work, almost orchestral in scope that requires musicians unafraid to take risks and really let go, while at the same time reining in when the music becomes subdued. 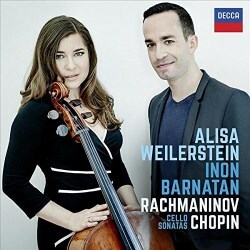 Weilerstein and Barnatan are just such artists, who tackle the work’s surging melodies and sweeping lines head-on and yet show enough restraint in the quieter passages to be really moving. I cannot think of another pair of musicians, other than perhaps Rostropovich and Argerich, who could do as much justice to this sonata as those on this CD. To my knowledge, the latter pair did not record the work as they did the Chopin Cello Sonata that accompanies it on the disc. Rostropovich did record the sonata with pianist Alexander Dedyukhin (DG), a performance that I have not heard. This powerful new account of the Rachmaninov is recorded up close, but with a rich and pleasing sound and excellent balance between the two instruments. I had the privilege of hearing Weilerstein and Barnatan in concert at the Kennedy Center in Washington, DC perform this sonata in January 2014 and was blown away by their performance. This new account is in no way inferior to that live performance and it takes me right back to the concert. I never really cared all that much before about the Rachmaninov Cello Sonata, but am sure I will be listening to this recording again and again. As an encore the duo perform the ubiquitous Vocalise and do not over-milk it in the least. Chopin’s Cello Sonata took me by even greater surprise than the Rachmaninov, as I have paid less attention to it than to the Rachmaninov. Again the instruments are well matched with the piano having billing equal to that of the cello, as one would expect from Chopin. The present artists are also well suited to this music and capture its Romantic spirit very well. They may not surpass Rostropovich and Argerich in this work, but then who could? They pay particular attention to the dynamics throughout, as one is unusually aware in the second movement Scherzo. The third movement is one of the composer’s loveliest songs and to my ears anticipates Leonard Bernstein’s “Somewhere” from West Side Story. Weilerstein and Barnatan perform it simply and beautifully. Chopin composed this sonata for his cellist friend, August Franchomme, and the cellist also had a role to play in the other Chopin works on the disc. He arranged the Étude in C sharp minor for cello, and Chopin later added the introduction to the Polonaise brillante for the cellist. The étude loses nothing in this arrangement from the original solo piano version and to my mind gains in the additional colour of the cello. I found less of interest in the early Introduction and Polonaise, but it concludes the programme in high spirits. With the success of these performances, I hope that Weilerstein and Barnatan will record other cello/piano repertoire, such as the Brahms sonatas. In the meantime, this has been a delightful listening experience from beginning to end.